it has a sufficient fing distance, which makes it support anglers under any condition. Within the small class lures, it is Sumlures confident and praised product. Plus at Lake Mead's tournament it was used as a key weapon and was the winning lure. She decided to participate in the WON Bass US Open 2001 Lake Mead tournament with her friend. fish, total weight of 10.22 lb. 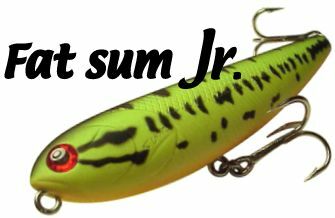 Among the five fish in the live well, three were caught by the Fat sum Jr.
2001 due to her indisputable result of the first day and the Fat sum Jr. was glorified as the winning lure. She said "The first day, small and big fish combined, the lure catching fish the most was the Fat sum Jr.
more fish. Without much agitation and without much waving I followed the walk-the-dog action." Her victory came from her exact situation analyses and from the power of the Fat sum Jr.
taste the tournament, you will want to participate in again. This is such an attractive tournament. Powerful Fat sum Jr. in Japan and abroad. Left photo is at a reservoir in Ehime Prefecture (Japan). Attachment/connection : It moves better with a snap or ring.